Sony really dropped the ball when it came to creating the PSVR’s Processing Unit. 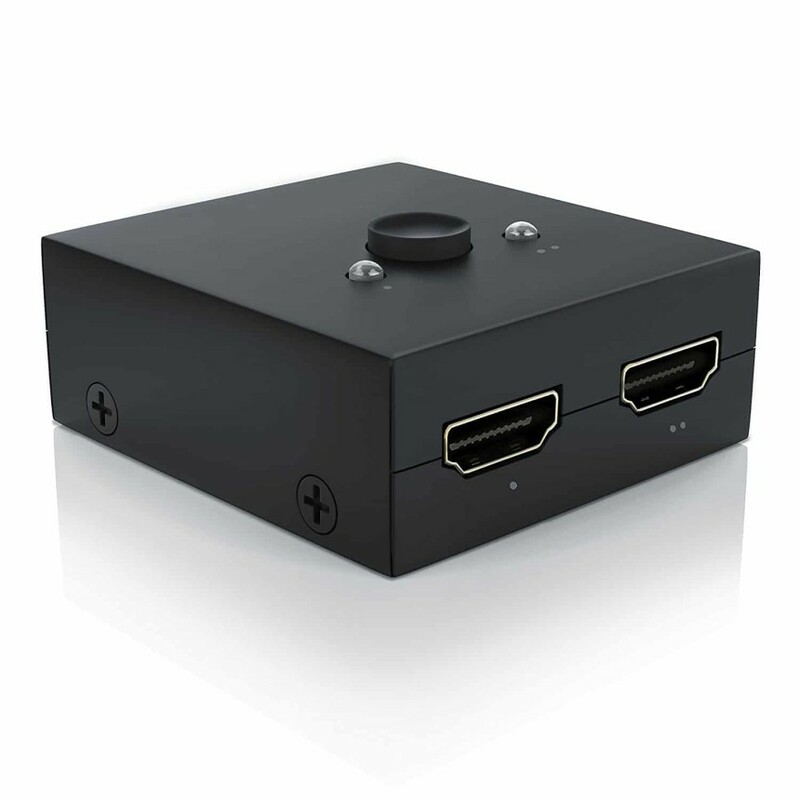 For those of you not in the know, the PSVR comes with a breakout box, which has to connect to your PS4 and your TV with a few extra HDMI cables. This is so that a person not wearing the headset can see what’s happening on the TV or see an alternate screen if the PSVR supports multiplayer. A great idea that reduces some of the isolationism that can be occasionally felt when using the headset. That said it does come with a rather large flaw; it lacks HDCP 2.2 support. HDCP 2.2 is required for the implementation of High Dynamic Range (HDR) in certain titles. Assuming your TV supports HDR then you’ll be treated to more accurate colour reproduction and more striking lighting effects. 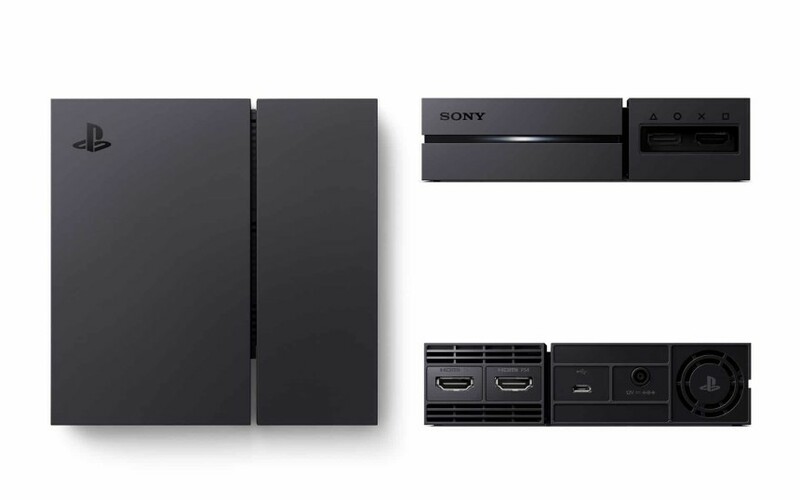 It’s not a deal breaker for most players, some say they can’t even tell the difference, but for AV enthusiasts like myself, it’s heartbreaking to have the feature stripped out of my PS4 Pro (HDR is also available on PS4) when I have my PSVR set up too. The free but highly impractical solution is to get down on your knees and unplug some cables every time you switch between regular games and PSVR, however, not only is this cumbersome and annoying but it could also cause premature wear of the HDMI socket on the PS4/PS4 Pro. The next solution is to buy a male to female HDMI lead/adapter. Leaving this permanently plugged into the back of your PS4 means that it’s only the connector exposed to wear upon switching. Neither of these solutions is good enough for me. With a wife who likes tidy, my entertainment setup doesn’t allow for cables to be pulled in and out all of the time, not only are they hard to access, the PS4 Pro and PSVR breakout box skid around our wooden floor every time they’re moved. So I decided to do some research on switches. There are hundreds out there to choose from. From low-cost 3-port switches to expensive multi-port powered devices, price, however, does not really come into it, it’s the supported specs that matter. Looking for a low-cost solution I bought five different 3-port switches from Amazon. All of them claimed to support HDCP 2.2, some of them claimed to support 60hz and only one of them claimed to support HDR. In addition to the switches, I bought three Amazon Basics HDMI 2.0+ High-Speed HDMI cables. A small £15 device made by a company called CSL. The box is around two thirds the size of a deck of playing cards, made of metal with a good weight to it. It allows one input and two outputs, however, being bi-directional this is rather inconsequential. On the top of the device is a push button which switches between the two outputs. A blue LED activates when a signal is detected. It’s a little bright for my liking but a bit of black tape and remembering whether depressed means one device or another soon sorted that. Initially, I couldn’t get the device to display anything at all from the PS4 Pro. The supplier suggested that I use shorter cables, but the brand new Amazon cables were 0.9m and anything smaller would have been impractical. I nearly gave up until I looked at the box of random HDMI cables I had lying around. Instead of going shorter, why not go longer? Success! In the end, it took two 1.5m, HDCP 1.4 cables from an old Sky+ box to get it working. However, with a bit more testing and switching to make sure it wasn’t a fluke; I’d finally found a device and cables that would switch between the PSVR and PS4 Pro while maintaining HDCP 2.2, 60Hz, RGB and the all-important HDR on the latter device. All without restarting the system. So if you’re looking to get a seamless PS4/PSVR HDR setup here is what you need. Firstly the switch. Next, you’ll need a lot of HDMI cables. I can’t recommend where to buy the Sky+ cables because I can’t guarantee they’ll be the same as mine. However, I do know that the supplied PS4/PS4 Pro cable doesn’t work nor do Amazon cables. So I suggest you try as many different ones as possible, it will work eventually. In some cases, you will get a flickering or snowy image, don’t persevere, ditch the cables and move on. You’re also going to need an additional HDMI socket on the TV. The cables you are focusing on are the two between the PS4, the switch and the TV. (Highlighted in red in the image below). The cables for the PSVR are inconsequential and you can use any cables you like. Quick side note: Stay well clear of gold plated cables and anything promising magic and dreams. They’re a con, you can read more about them here. What’s happening is that the PS4 is feeding all of its signals into the switch. If left on the standard configuration, the original HDR HDCP 2.2 signal will pass straight through to the TV. Pressing the button on the switch sends the same signal through to the PSVR box. 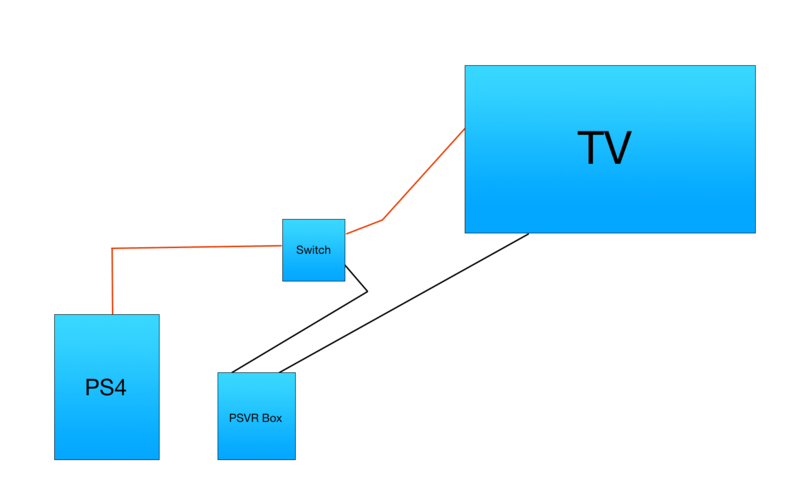 The PSVR box will strip the signal to HDCP 1.4 and then pass it to the TV. A great thing about this switch is that it will happily do all of this without a reboot. So there we have it, an almost perfect PSVR/PS4 setup. I wish I could promise you that it’s going to work out of the box but that’s not true. Prepare to tear your hair out as you try tens of HDMI cables to get a result. However, if you want to swap between glorious HDR and the PSVR with the touch of a button. It’s worth the effort. Chiptune Radio: Add some 8-bit to your life!